Rembrandt van Rijn (1606 to 1669) was a Dutch baroque painter, draughtsman, and printmaker who was not only one of the greatest artists of all time, but created the most self-portraits of any other known artist. He had great success as an artist, teacher, and art dealer during the Dutch Golden Age, but living beyond his means and investments in art caused him to have to declare bankruptcy in 1656. 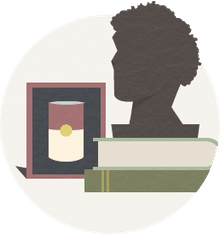 His personal life was also difficult, losing his first wife and three out of four children early on, and then his remaining beloved son, Titus, when Titus was 27 years old. Rembrandt continued to create art throughout his hardships, though, and, in addition to many biblical paintings, history paintings, commissioned portraits, and some landscapes, he produced an extraordinary number of self-portraits. These self-portraits included 80 to 90 paintings, drawings, and etchings done over approximately 30 years beginning in the 1620s until the year he died. 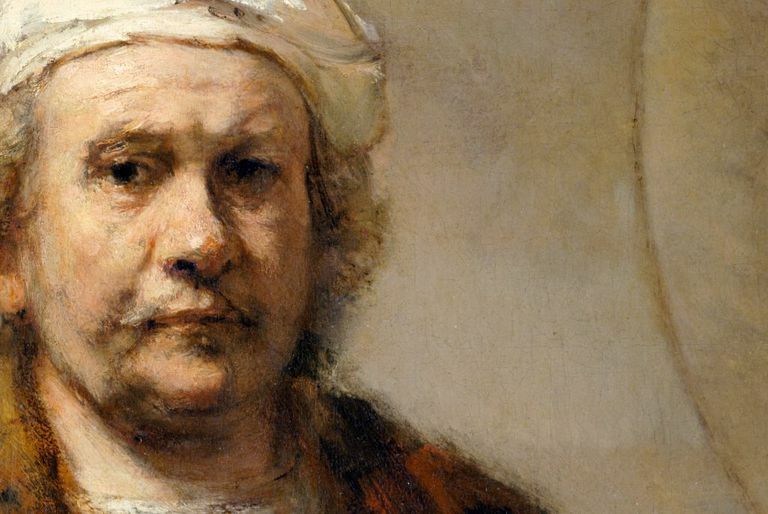 Recent scholarship has shown that some of the paintings previously thought to have been painted by Rembrandt were actually painted by one of his students as part of his training, but it is thought that Rembrandt, himself, painted between 40 and 50 self-portraits, seven drawings, and 32 etchings. The self-portraits chronicle Rembrandt's visage beginning in his early 20s until his death at the age of 63. Because there are so many that can be viewed together and compared with each other, viewers have a unique insight into the life, character, and psychological development of the man and the artist, a perspective of which the artist was profoundly aware and that he intentionally gave the viewer, as though a more thoughtful and studied precursor to the modern selfie. Not only did he paint self-portraits in steady succession during his life, but in doing so he helped advance his career and shape his public image. Although self-portraiture became common during the 17th century, with most artists doing a few self-portraits during their careers, none did as many as Rembrandt. However, it wasn't until scholars started studying Rembrandt's work hundreds of years later that they realized the extent of his self-portraiture work. These self-portraits, produced fairly consistently throughout his life, when looked at together as an oeuvre, create a fascinating visual diary of the artist over his lifetime. He produced more etchings until the 1630s, and then more paintings after that time, including the year he died, although he continued both forms of art all his life, continuing to experiment with technique throughout his career. The portraits can be divided into three stages — young, middle-age, and older age — progressing from a questioning uncertain young man focused on his outward appearance and description, through a confident, successful, and even ostentatious painter of middle-age, to the more insightful, contemplative, and penetrating portraits of older age. The early paintings, those done in the 1620s, are done in a very lifelike manner. Rembrandt used the light and shadow effect of chiaroscuro but used paint more sparingly than during his later years. The middle years of the 1630s and1640s show Rembrandt feeling confident and successful, dressed up in some portraits, and posed similarly to some of the classical painters, like Titian and Raphael, whom he greatly admired. The 1650s and 1660s show Rembrandt unabashedly delving into the realities of aging, using thick impasto paint in a looser, rougher manner. While Rembrandt's self-portraits reveal much about the artist, his development, and his persona, they were also painted to fulfill the high market demand during the Dutch Golden Age for tronies — studies of the head, or head and shoulders, of a model showing an exaggerated facial expression or emotion, or dressed in exotic costumes. Rembrandt often used himself as the subject for these studies, which also served the artist as prototypes of facial types and expressions for figures in history paintings. Self-portraits of well-known artists were also popular with consumers of the time, who included not just nobility, the church, and the wealthy, but people from all different classes. By producing as many tronies as he did with himself as the subject, Rembrandt was not only practicing his art more inexpensively and refining his ability to convey different expressions, but he was able to satisfy consumers while also promoting himself as an artist. Rembrandt's paintings are remarkable for their accuracy and lifelike quality. So much so that recent analysis suggests that he used mirrors and projections to trace his image accurately and to capture the range of expressions found in his tronies. Whether or not that is true, though, does not diminish the sensitivity with which he captures the nuances and depth of human expression. This self-portrait, also called Self-Portrait With Dishevelled Hair, is one of Rembrandt's first and is an exercise in chiaroscuro, the extreme use of light and shadow, of which Rembrandt was known as a master. This painting is interesting because Rembrandt chose to conceal his character in this self-portrait through the use of chiaroscuro. His face is mostly hidden in deep shadow, and the viewer is barely able to discern his eyes, which stare back emotionlessly. He also experiments with ​technique by using the end of his brush to create sgraffito, scratching into the wet paint to enhance the curls of his hair. This portrait in Mauritshuis was thought for a long time to be a self-portrait by Rembrandt, but recent research has proven that it is a studio copy of an original by Rembrandt, believed to be in the Germanisches National Museum. The Mauritshuis version is different stylistically, painted in a tighter manner compared to the looser brush strokes of the original. Also, infrared reflectography done in 1998 showed that there was an underpainting in the Mauritshuis version which was not typical of Rembrandt's approach to his work. In this portrait Rembrandt is wearing a gorget, protective military armor worn around the throat. It is one of the many tronies he painted. He used the technique of chiaroscuro, again partially concealing his face. This painting is normally at the National Gallery in London. The self-portrait portrays Rembrandt in middle age enjoying a successful career, but also having endured life's hardships. He is portrayed as self-confident and wise, and is dressed in attire that connotes wealth and comfort. His "self-assurance is reinforced by his steady gaze and comfortable pose," a pose that again asserts his "rightful place as one of the most sought-after artists" of the time. "We read these images biographically because Rembrandt forces us to do so. He looks out at us and confronts us directly. His deep-set eyes peer intently. They appear steady, yet heavy and not without sadness." However it is important not to overly romanticize this painting, for indeed, some of the somber quality of the painting was actually due to thick layers of discolored varnish which, when removed, changed the character of the painting, making Rembrandt look more vibrant and vigorous. In fact, in this painting — through pose, attire, expression, and lighting that accents Rembrandt's left shoulder and hands — Rembrandt was emulating a painting by Raphael, a famous classical painter he admired, thereby aligning himself with him and casting himself also as a learned and esteemed painter. By so doing, Rembrandt's paintings reveal that, despite his hardships, and even failures, he still retained his dignity and self-respect. Rembrandt was a keen observer of human expression and activity, and focused that gaze on himself as intently as upon those around him, producing a unique and vast collection of self-portraits that not only display his artistic virtuosity, but also his profound understanding of and sympathy for the human condition. His deeply personal and revealing self-portraits, particularly those of his older years in which he does not hide from pain and vulnerability, resonate strongly with the viewer. Rembrandt's self-portraits lend credence to the adage that "what is most personal is most universal," for they continue to speak powerfully to viewers across time and space, inviting us not only to look closely at his self-portraits, but at ourselves as well.